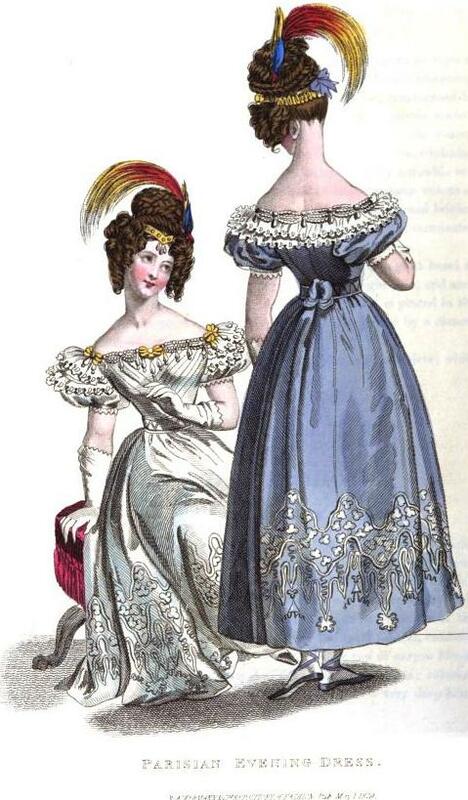 here we are again with more prints of morning, evening and fancy dresses from the year 1829. What do you think of them? Do you like the styles that were popular back then? Dress of cotta pali, oiseau de Paradis colour. The corsage is disposed in plaits, diagonally placed across the bust, and fastened on the shoulders by a narrow band. The waist is confined by a broad band of the same material as the dress. The skirt set full all round, simply ornamented by a deep hem. Sleeves a l’eveque, set in a broad band, tight to the wrist. A lace ruche round the neck. Cap a la fiancee. The crown, which is fastened to a rouleau of lilac satin, is made to set close to the head. Three rouleaux of lilac satin arched over the crown. Between the rouleaux and round the crown is placed a blonde trimming, interspersed with artificial flowers. The rouleaux meet in a bow on the sides of the head, from which long strings of lilac gauze riband extend to the waist. Hair a la Madonna. Black tissue bracelets, with gold clasps; lilac kid gloves; black satin shoes and sandals. A dress of crepe Aerienne, of a delicate lilac colour, over an under dress of rich lilac satin. The corsage is cut square and exceedingly low; it is tight to the shape, and finished round the top of the bust with a trimming of pearls; there are three rows disposed in festoons by butterflies of gold fillagree work, from each of which an ornament of the shape of a pear is pendant. Short sleeves of the usual fulness, confined to the arm by satin rouleaux, and terminated by a row of narrow blonde lace. 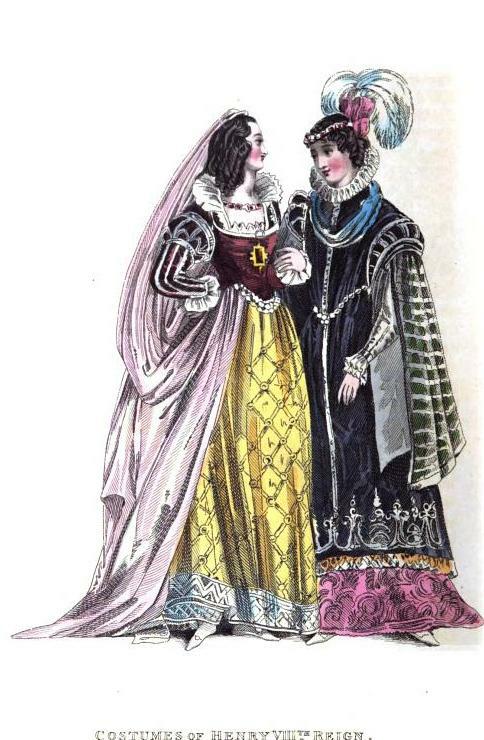 The mancheron is composed of a double fall of blonde; ceinture of lilac satin: the trimming of the skirt consists of a very deep hem, reaching nearly to the knee, richly embroidered in white floize silk in a Chinese pattern; the trimming is not quite the depth of the hem. The hair is much parted on the forehead, and dressed in a profusion of heavy curls, which fall very low on each side: the hind hair is disposed in bands brought round the head, the rest is arranged in short full,bows on the crown of the head: a bird of Paradise plume is placed on the left side, and a bandeau of richly wrought gold is worn round the head, secured by bows of lilac satin behind. Shoes of lilac satin, with rosettes of white; in the centre of each is a lozenge of gold fillagree work. White kid gloves. Au Indian muslin gown, corsage uni, cut low, and finished round the bust with a double fall of rich Mechlin lace, and a trimming of beads similar to the one we have already described; the back of the dress is narrower between the shoulders than we have recently seen them; short full sleeve. The skirt is set on in deep plaits at the sides, and the fulness immediately in the centre of the back is disposed in large gathers. Ceinture of white satin, richly embroidered, and fastening behind in bows without ends: the trimming of the skirt is a very deep biais of white satin, very richly embroidered in silk. Coiffure similar to that already described, except that a bandeau of gold, embroidered with small pearls, goes round the head, and is so arranged as to form the letter V on the forehead : three pendants fall from the point, similar to those which ornament the dress: a bird of Paradise plume is placed at the left side, rather far back. White satin sandals; white kid gloves. 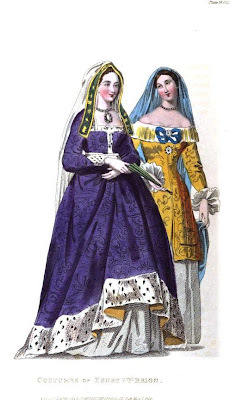 The figure in front represents the costume of a lady of distinction at the court of Henry the Seventh: the dress is composed of a rich purple damask, brocaded with flowers of a shade darker than the ground: the skirt is made with a train, and very full; finished round the hem with a broad border of ermine. The boddice is cut square, and very tight to the figure ; the back narrow and high. The sleeves, which fit as close as possible to the arm, are terminated at the wrist. Unfortunately, the rest of the descriptions of these gowns is missing, but I thought they were to pretty not to included in this post. Dress of Aurora colour crepe aerophone over a satin slip of the same colour; the corsage made close to the shape, displaying to advantage the fine formed bust; it is made extremely low on the shoulders, and adorned in the centre and sides with pinnatifid columns of satin; the sleeve short and very full; the skirt is ornamented by tucks half a quarter wide, extending half way up the dress: pinnatifid columns extend perpendicularly, and give a grace and finish to this noyel kind of dress. The head-dress is composed of an Aurora coloured hat, profusely decorated with large plumes d’Autriche and large bows of striped gauze riband; under the brim of the hat, on the left side, is placed a rosette, composed of blonde and riband, like that which decorates the crown. Pearl necklace; white satin shoes and sandals; white kid gloves. 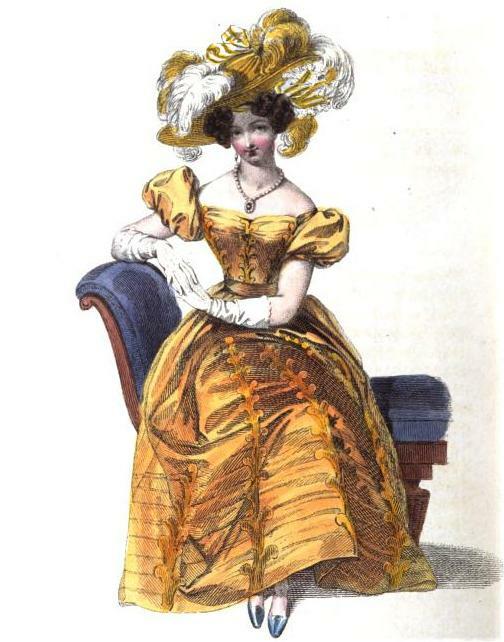 A full petticoat of rich amber taffeta, embroidered in a pattern of trellis-work, worked in gold: at each crossing of the pattern is placed a single large pearl; the border is composed of white satin, worked to correspond with the dress; the fulness of the skirt is disposed in large plaits on the hips, and continued in smaller folds in front; over this is worn a train ofpale blush-coloured lutestring, which is fastened behind in loose folds from the shoulders in the form of a sacque; it is secured at the sides in plaits from the boddice, which is composed of crimson velvet; it is cut close to the figure and is rather low; the waist is long and forms a stomacher, which is richly decorated with pearls and different coloured gems; in the centre of the waist is placed a large brooch of an antique form, consisting of a single ruby surrounded with pearls. The sleeves are in the Spanish style, and are perfectly tight to the arm, ornamented by bands of silver, a row of which surrounds the top of the sleeve, and confines the full puffs of velvet forming the epaulettes. Under the boddice is worn an open vest of cerulean blue satin, embroidered with pearls: it is left quite open in front, to display the throat; a full ruff of rich lace stands up at the back of the neck, and a narrow row of rich Vandykes shade the bust. The coiffure consists of the hair drawn very much off the forehead, and disposed in long ringlets, which fall on the neck; a long veil of rich lace descends nearly to the feet and completes the dress. Necklace of rubies set in wrought gold; shoes of white lutestring. A train petticoat of bright rose-coloured damask, over which is worn a tunic of dark purple velvet, reaching a little below the knee, where it is bordered by a rich gold fringe. The waist is very long, and forms a peak in front. The edge of the tunic is ornamented by a deep border of an elegant pattern, embroidered in silver, which is continued in a narrow band up the front of the robe. The sleeves are very remarkable, and consist of a drapery of rich emerald satin, striped with silver: they are left open in front, and are cut square and very full, and hang down nearly to the knees: they are lined with white satin, and finished round the edge by a narrow gold cord. Under these draperies are worn tight sleeves of white satin, ornamented with gold, which fit quite tight to the arm: they are finished at the wrist by full double cuffs of point lace; in addition to these, and over the falling sleeves, are placed epaulettes of velvet, banded with silver, full at the top of the shoulder and continued narrower under the arm, in the manner represented in the engraving. A full ruff of rich pointed lace is worn round the throat, secured by a jewelled clasp in front. Round the bust is carelessly thrown a small scarf of bright blue silk. The hair is much divided in front, and is dressed in full curls on each side. The headdress is composed of green satin, profusely ornamented with jewels, a band of which is placed round the edge of the cap and forms a point at the forehead. At the back of the head is placed a superb plume of white ostrich feathers, intermingled with full bows of rose coloured satin and jewels. Bracelets of gold, with large antique clasps, set with rubies; girdle of Oriental pearls; gloves of white kid, embroidered with gold; shoes of white damask. A gown of Cotpali of a new pattern in azure and white. Corsage uni, made up to the throat, and to fasten behind; the front is cut biais, and very low on the shoulders, so as to display the shape of the bust to very great advantage. Mameluke sleeve of the usual width. White ceinture embroidered in azure, in a Grecian pattern, fastened in front with a buckle of gold fillagree work. The skirt is cut without gores; it is sufficiently full to hang in graceful folds,’but is not quite so wide as they have been recently worn. A trimming to correspond with the gown reaches in the ourlet style nearly to the knee, and terminates in dents de Scie. A rich silk fringe of intermingled bronze and azure is placed immediately below the dents. Head-dress a bonnet of rice straw of the demi capote form, and of a large size; the inside of the brim is ornamented with a trimming in foliage of rose coloured gauze riband; the strings which correspond in colour, pass through the edge of the brim, and fasten at the side. A rouleau to correspond, ornaments the edge of the brim, and the crown is profusely trimmed with roses of various colours. Parasol of bronze-coloured gros de Naples, lined with deep blue, and trimmed with bronze coloured fringe. Bottines of black kid and grey gros des Indes. Lemon coloured gloves. Canezou en fichu of white lace.